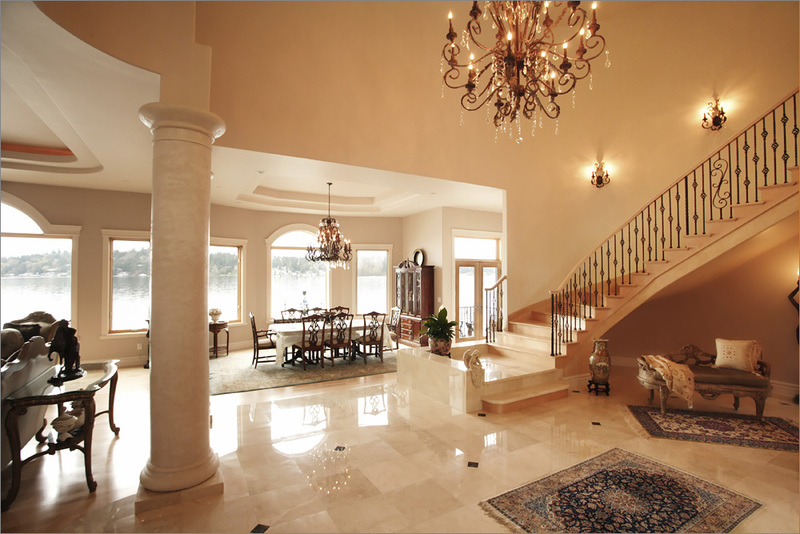 Crema Marfil marble is quarried from a bedrock quarry in Spain. Crema Marfil is a beautiful cream colored marble with pencil veining. Some slabs may have more veining and color than others. Crema Marfil is also called: Cream Marfil, Zafra, Classico Coto and Crema Marfim. Remember, Crema Marfil is a marble and marble can etch! Anything acidic that gets on the stone will etch it. Read more about etching here. Check out this amazing staircase, all done out of Crema Marfil slab. This was a lot of work and it looks like the fabricator did a fantastic job. Crema Marfil is available in 2 cm and 3 cm slabs as well as tile. Love the creamy look of this marble. I'd be worried about slipping down that marble staircase, though! It looks especially great in the spa - LOVE the super-thick countertop! This Crema Marfil Marble we think is the most prettiest marble for floors ever. It goes with dark cabinets, lght cabinets and different decorating styles of furniture than any other I've seen in the market. I have been pleased with my selection in 2005. Most of the marble is easy to keep up. We have some areas that have dulled due to we are told someone had put a product on it to shine it up without polishing the stone itself. Well, we are bringing stone specialist in to get those area right again. They said, that it would only need once a year after that for them to come in for maintenance true polishing which in my opionion is unbeliavable but, they know their business and has one of the best reputation for preserving and fixing natural stones. We did have the travertine smaller squares put in the foyer on the triangle turn like in the photograph and we do get people look at it and say it is a wow factor. Best things in life are naturally made!